Happy Friday Friends! YAY! It's almost the weekend! I hope you all had a wonderful week! Here's my card for this week. I made it for the CAS challenge over at SCS to make a summer card. What's more summer than ice cream? The stamps are from Unity's Perfect in Every Way kit. It's a past KOTM. The paper is DCWV Citrus Stack. Doesn't it look yummy? I wish it was summer weather here but we had a ton of rain here today. So odd! I was exhausted last night when I wrote my post and forgot to add this Ippity card I made into the post. How sad for this poor little card, huh? So, I'm editing to add it. This is a card I made for the sketch over at 2Sketches4You this week. I'm in love with this sketch! I think it's super fun! I used Ippity's The Simple Things set for this. And the paper and the sentiment sticker are Cosmo Cricket's DeLovely. I can't put that paper pad down! It's amazing!! The ribbon is Bazzill. Have a great weekend everyone! Drop by the Unity Blog and check out everyone on the hop today! Yum! love this, love that image! Ashley, this is a great taste of summer!! Super cute! This is so cute and refreshing. It just makes me want some ice cream. Love the colors too. Fabulous! 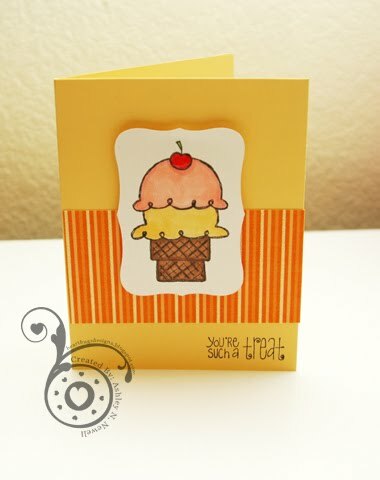 LOVE the yummy icecream cone and colors! So perfect for summer! Fabulous cards! OMG, I almost used that ice cream image tonight! Great stuff.